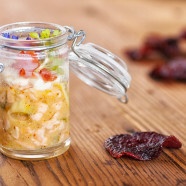 As an amuse-bouche or appetizer, this wild salmon tartar enhanced with wasabi cream and crispy beetroot chips is an explosion of tastes for the palate in summer. 1 medium beetroot Peel, wash and dry beetroot. With a knife, cut beetroot into 2mm slices. splash of olive oil Line a baking sheet with foil and brush with oil. Lay the beetroot slices side by side on the foil. splash of olive oil Drizzle with olive oil and cover with another layer of foil. Salt Remove from oven, salt and set aside. 4 tablespoons olive oil Cut the salmon into 5 mm slices crosswise, then into 5mm slices lengthwise and finally into little cubes of 5mm. Mix the raw salmon cubes with the lemon juice and olive oil in a salad bowl. 20 hyssop flowers Pluck off the basil leaves and add them to the salmon together with the hyssop flowers. 1 small ripe but firm avocado Peel the avocado and cut into 5mm slices lengthwise. Add to the salmon tartar. 4 pinches Espelette chili Season with salt, pepper and Espelette chili according to your taste. Salt Whip the mascarpone with the wasabi by hand until well incorporated. Salt as desired. Chill. 1 small ripe, firm tomato Wash the tomato. Cut into half, remove the pulp and slice into 5mm strips and then into 5mm cubes. Set aside. 2 fresh radishes Wash the radishes and cut into fine slices. Set aside. basil sprigs with small leaves Wash the hyssop flowers and basil. Set aside.